Born in San Jose, Costa Rica, Mario Maffioli studied at the University of Costa Rica, School of Fine Arts, with an emphasis in painting, Mario lives and works on the Pacific coast. In 1993, Mario received the. Achilles J Echeverria award in painting by the Ministry of Culture, Youth and Sports, the group Bocaracá, San Jose, Costa Rica. Solo exhibits include:2007, Union Banque Suisse, 1997-2007 Art in Banking Program, UBS; the Grove Hotel Intercontinental, San Jose, Costa Rica, 2007: Natural Color, Amon Gallery, San Jose, Costa Rica; 1997 Macro stickers, Museum of Contemporary Art and Design, San Jose, Costa Rica; Abstraction Naturalist 1996, National Gallery of Contemporary Art, San Jose, Costa Rica; 1996 Homage to Impressionism, Enrique Echandi Gallery, National Theatre, San Jose, Costa Rica. In group exhibitions: 2009, Pura Vida, Red Space, Regional Hospital, University of Parma; Italy. 2009, XV Anniversary Museum of Contemporary Art and Design, San Jose, Costa Rica. 2009; Light and Landscape, Central Bank Museum, San Jose, Costa Rica. 2009; Latin American Abstraction, Art Consult, Panama, Panama; 2008, I Chapingo contemporary art biennial, Agricultural University of Chapingo, Texcoco, Mexico; 2008, Oblique Horizons, Museum of Contemporary Art and Design in Costa Rica; 2008, Confrontation II, National Gallery, San Jose, Costa Rica; 2008, Abstract, traveling exhibition, Managua, Leon and Granada, Nicaragua; 2008 Alternative Visions Gallery, Crowne Plaza, Panama; 2007 Modernism Today, LA, International Airport, USA; 2007, The Possibilities of Mirada, Costa Rican Art Museum of San Jose Costa Rica; 2007 The Possibilities of Gaze, Museum of Contemporary Art in Santiago Chile; 2007 Meeting Sensations and Colors, Museum of the Americas, San Juan Puerto Rico; 2007 Fabio Herrera and Mario Maffioli, SAS Institute AB, Stockholm Frösundavik Slott, Sweden; 2007 Watercolor, Costa Rica, Official School Administrative Managers of Granada, Jaen and Almeria, Spain. 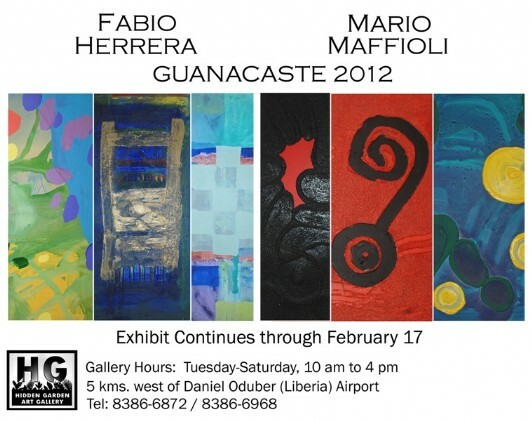 Bocaracá; 2006, Museum of Contemporary Art San Juan Puerto Rico; 2005 The second International Festival Harbord Pyongtaek, Pyontaek, South Korea; 1997 Contemporary Painting in Costa Rica, Art Gallery of Piraeus, Greece; 1993, Die Expresionistichen Tendenz, Kunst aus Costa Rica, Sprengel Museum, Hannover, Germany. 1992; Kunst aus Costa Rica, traveling exhibition in Germany, public galleries of the cities of: Karl Marl, Ludeschein, Seel Siegens, Lembo, Paderborn and Herford. Read about Mario Maffioli in A.M. Costa Rica. Read about Mario in La Nacion, Ancora.